Made this curry from a recipe I saw in a past issue of Thrive. The author says its mild enough for her two year old who loves it so I thought I'd try it for dinner. 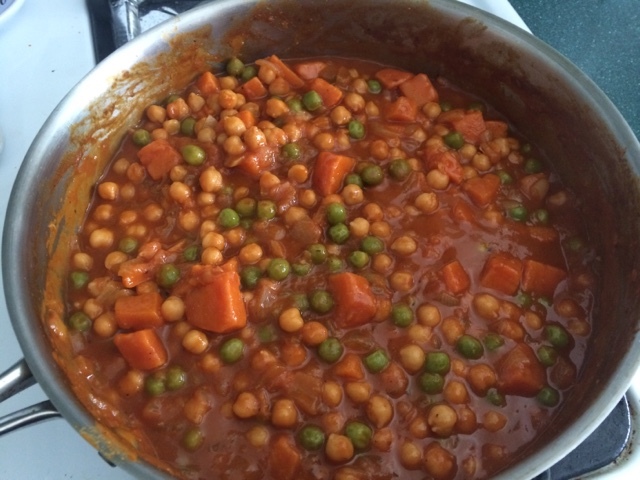 It's basically a coconut milk and tomato paste base with ginger, curry powder, cumin, coriander as the spices and chickpeas, peas and sweet potato. It's very mild and to me, very sweet. It's all from the sweet potato and I guess the coconut milk as well. I added some lemon juice and extra salt to tone down the sweetness. Henri ended up eating a whole (baby sized) bowl with basmati rice which I was super happy about. For my bowl, I squirted more lemon and Sriracha hot sauce and it was pretty good.